You can usually find apple cider all year long, so check the glass-bottle aisle for juices and you should find it. Then you’re in business, because I’m sure you have all the other stuff from how often we make baked oatmeal with the same base! Banana, flax/chia, maple syrup… Nom! 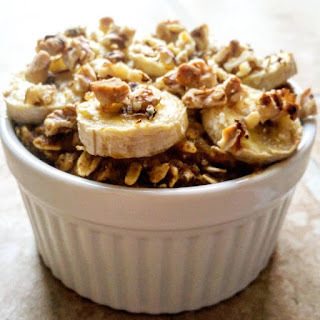 This one is just as easy as the other baked oatmeal recipes I have on the blog. And it’s just as delicious. If not more so. I adore using apple cider in these because it naturally sweetens these recipes, so I hope you’ll give this one a shot, even though it’s not currently fall! I love baked oatmeals, y’all. So I hope you’ll try some of the other ones I have up here, like Sweet Potato Pie, Pineapple Upside-Down Cake, Apple Pie, Blueberry French Toast, and Carrot Cake. Check out all of them by going to the baked oatmeals page! Delicious, sweet, and perfectly spiced Baked Apple Cider Oatmeal! 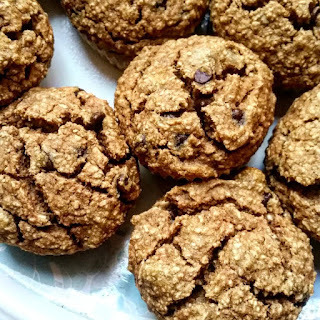 It's vegan, gluten-free, and super yummy for that fall feeling! Preheat oven at 350 degrees F (176 C) and ready your ramekin (either with parchment paper or nonstick spray - I choose to bake this oatmeal without either). In a medium bowl, mix mashed banana, applesauce, and apple cider well. Add cinnamon, (optional) turmeric, flax/chia, and (optional) maple syrup and mix well to combine. Mix in oats, apple, and (optional) walnuts. You may choose to leave some pieces of apple and/or walnuts out to top the mixture with. Place mixture into ramekin and top with apple, walnuts, and cinnamon sugar. Then bake for 20-25 minutes.